HG "Sep 22 2012", "11:38:28"
The Belts Library contains elements for the static and dynamic analysis of belt drive systems. The Belts Library includes components like levers, endings, wraps, contact models, functions for belt calculations and interfaces for belt drive components. 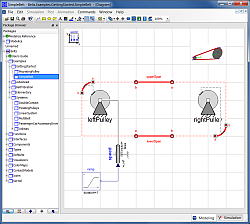 Adapted advanced animation components make it easier to understand the dynamic behaviour of the model. Visualizers for 2- and 3-dimensional visual objects are used for animation of the belt drive (see below). Many examples are delivered to explain the usage of the Belts Library. A User's Guide completes the package. Version 3.2.1 of this library is available for Dymola. 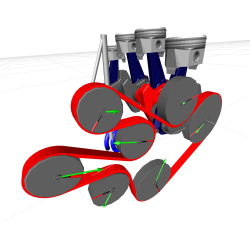 Tested on Dymola 2012 and Modelica Standard Library 3.2.